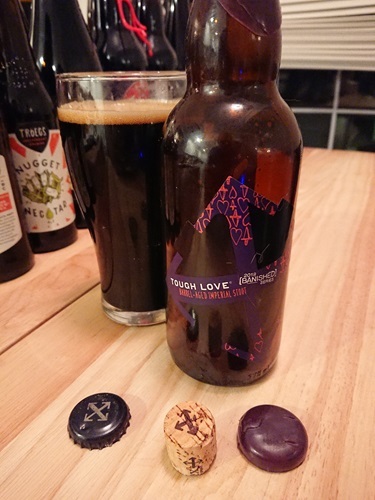 Tough Love is bold but nuanced, an homage of sorts to the traditional Russian Imperial Stouts and the ruling style of Catherine the Great. We construct it with dark roasted malts, malted rye, and oak-smoked wheat, and then banish it in Kentucky bourbon barrels. The aging process smooths out the edges on an otherwise bold statement, and bitterness succumbs to tender strokes of vanilla beans, hints of dried cherries, and new layers revealing themselves with each sip.